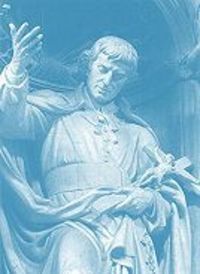 Today is the feast the Blessed Virgin Mary's indefatigable servant and champion, St. Louis Marie Grignion de Montfort, founder, missionary, and author of the treatise, True Devotion to Mary. "The motto is of course inspired by the teaching of Saint Louis Marie Grignion de Montfort, who explained in the following words Mary's role in the process of our configuration to Christ: 'Our entire perfection consists in being conformed, united and consecrated to Jesus Christ. Hence the most perfect of all devotions is undoubtedly that which conforms, unites and consecrates us most perfectly to Jesus Christ. Now since Mary is of all creatures the one most conformed to Jesus Christ, it follows that among all devotions that which most consecrates and conforms a soul to our Lord is devotion to Mary, his Holy Mother, and that the more a soul is consecrated to her the more will it be consecrated to Jesus Christ.'" --Pope John Paul II, Rosarium Virginis Mariae, quoting "True Devotion to the Blessed Virgin Mary" by St. Louis de Montfort (emphasis in original). St. Louis was so faithfully devoted to Our Lady that I cannot help but think of his late April feast as her special favor to him, bestowing upon him the honor of heralding the glorious month of May! St. Louis reminds us that now is the time to freshen up our favorite tablecloths, take down vases, decorate pillar candles, and choose our most beautiful Marian statues to create a family May altar in time for Our Lady's blessed month. In the meantime, the young ones in our homes will enjoy creating personal May altars to grace their rooms during this Marian season and always. 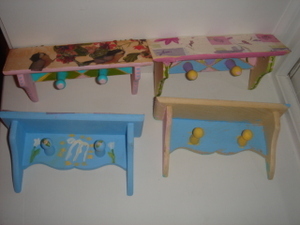 The children began by decorating inexpensive wooden shelves in pastel colors. Agnes chose to adorn hers with roses, lilies, an an "M" wreathed in twelve stars, before decoupaging a flower-flecked "altar cloth" on top. 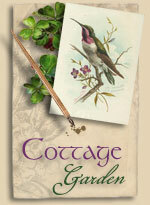 The decoupage was done simply, by applying watered-down white glue to tissue with a sponge brush. 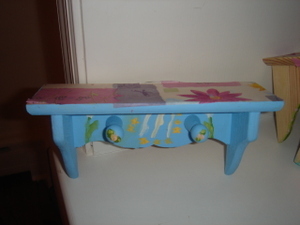 "Mod Podge" decoupage medium could have been used to add a glossy coat to the decoupage, but we opted for the simple approach. 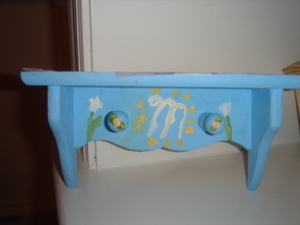 The next group shows what each painted shelf looked like once adorned with a Marian statue, holy water bottle, crucifix, rosaries, and scapular (or, in Marie's case, a bouquet of flowers). These photos were taken in our dining room, but, each of the girls will have a May altar mounted over her bed from now on. We usually say our family Rosary at night, so the beads will have a handy home, as will their scapulars. I am glad to think of my girls looking at the Crucifix and Our Lady of Guadalupe at eye level as they doze off to sleep, perhaps after a blessing of holy water from each individual bottle. It is difficult to make out from the picture, but each girl chose a distinct holy water bottle with images of the cross, Our Lady of Guadalupe, Our Lady of Grace, or Our Lady of Lourdes. Cost per project: 97 cents without paint and other decorations; about $1.50 each with paint, brushes, glue, and special decoupage tissue. 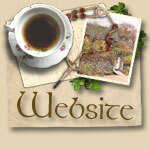 The adornments for the altar may be found around the house. If you do not have a small statue of Our Lady, a holy card mounted on cardboard would work every bit as well. Other ways to improvise: If you do not have time to run to the craft store for small paintable shelves, use something on hand to create a similar effect. Even an upturned shoe box will look beautiful when covered with a piece of pretty fabric, statue, flowers, and a bowl of holy water. 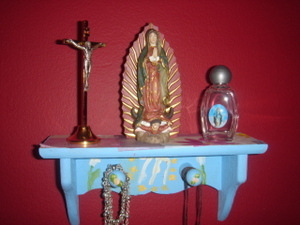 The main joy of the project for my girls seems to be that each one has an altar all her own right near her bed. Six-year-old Marie looks forward to keeping hers adorned with fresh spring flowers, and, for a setting so small, an empty film canister would make the perfect little vase! What a GREAT idea. I think I will do this with my girls. BTW I love the red wall. To Jesus through Mary! I especially noticed the way each shelf reveals something dear and unique about its designer. Alice, these are just beautiful! 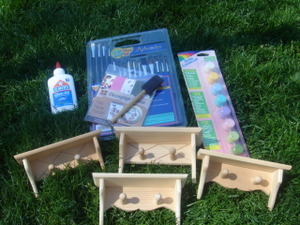 I am heading to the craft store today for these very materials. I will let you know how they turn out. :) Thank you so much for the inspiration! Oh Alice, these are so beautiful. I love projects that show individuality AND usefulness! And at such a small price! Thanks for sharing another one of your fabulous, marvelous ideas! These are so sweet! And so simple- a big benefit at our house! Thanks for sharing! Alice, what a wonderful idea! I am looking forward to trying this at home with my children. Thank you also for the information on St. Louis de Montfort and the writings of Pope JPII on Marian devotion as well. I so appreciate your kind, creative heart! Thank you for your beautiful post on St. Louis Marie Grignion de Montfort. My dad and my brother are named Louis, after him and after King St. Louis IX. 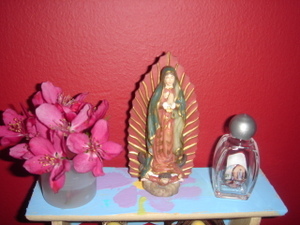 In addition, thank you for sharing your Mary Altars. They look wonderful! Thank you for a meaningful and simple Marian project that my daughters will love...Where did you find your lovely holy water bottles? >>Where did you find your lovely holy >>water bottles? We were fortunate enough to discover them at our local religious goods store. I'm so glad you liked them. 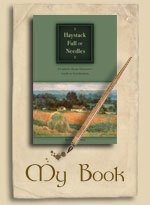 I can't begin to thank all of you for these kind and generous comments. Sorry to be late (again) :) but I wanted to add my appreciation and awe for these beautiful craft ideas! 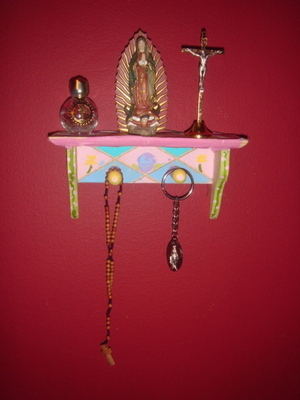 >> I am glad to think of my girls looking at the Crucifix and Our Lady of Guadalupe at eye level as they doze off to sleep, perhaps after a blessing of holy water from each individual bottle. Thank you for this idea. We'll be doing this craft for our Little Flowers summer camp next month. Our daughters can hardly wait...and I can hardly wait for them to have one in their room! what a nice idea! 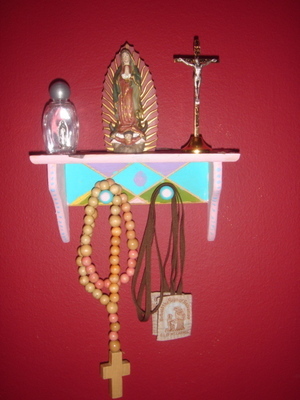 And really, no need to go to the craft store...I see small shelves like this for very little money at garage sales and thrift stores - and also statues, beaded flowers ( I have some vintage beaded flowers on my altar ) and other items that would be nice to use. I think this would be a great idea for my young nieces, who love to look at and rearrange the items on my altar.